Valid for new clients and clients that haven't visited within six months. Valid for use at one Vivo salon in the Nelson region. Valid to use weekdays during regular salon opening hours only. Available with select stylists. Must be used in a single visit. Bookings essential, must mention GrabOne when booking. Subject to availability. 24-hour cancellation/amendment policy (including no shows) applies or coupon is void. Valid at specified salon location only. Available with select stylists. Must be used in a single visit. 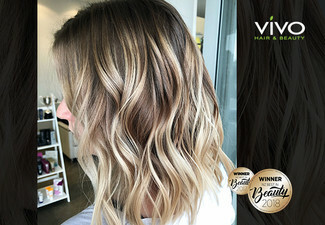 Upgrade to balayage (ombre) for $40. Extra charges may apply from $11 for hair past shoulder length or thick hair, $22 for toner; $40 for colour between foils. Pre-lightening or colour correction will incur a surcharge from $50. No refunds unless required by law. No cashback. Not valid with other offers.